Corporations behaving badly: During a recent conference, a Marriott chain used wireless-blocking technology to shut down any outside personal internet connections. This left conference-goers and guests no other choice than to pay for the hotel’s internet service. 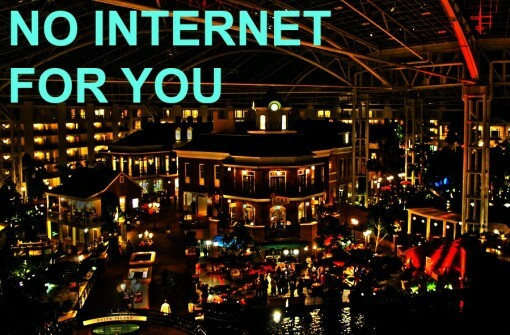 Some of the hotel’s employees at the Gaylord Opryland Resort & Convention Center in Nashville, Tennessee used jamming systems to block wireless hotspots created from users’ tablets, wifi devices and mobile phones. Marriott charged conference exhibitors and other attendees $250 to $1,000 per device to use the Gaylord Wi-Fi service in the conference facilities. The worst part of this story is that Marriott defended their actions: “Marriott has a strong interest in ensuring that when our guests use our Wi-Fi service, they will be protected from rogue wireless hotspots that can cause degraded service, insidious cyber-attacks and identity theft,” Jeff Flaherty, a company spokesman, said in an e-mailed statement to Bloomberg. Uh-huh Jeff, blah blah blah. No one believes your security reasoning or that you’re protecting users from “insidious cyber attacks” — like you actually give a damn. Let’s talk about what you give a damn about: money and bottom line and stock prices. That’s where you’re actual, real “strong interests” are. See you in hell.